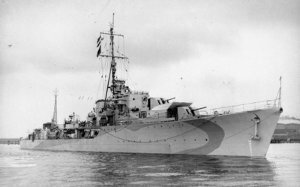 Dimensions 358'3" by 35'8" by 9'6"
The Saumarez were completed in 1943-1944 as the third group of War Emergency Destroyers or "Cubs". They differed from the previous "Q" class in having 4.7" gun mounts that could elevate to 55 degrees, though this was still inadequate for antiaircraft fire, and in replacing the pom-pom with two radar-directed Bofors guns. The "T" class, which was essentially identical, are also included here.